Strong Families Blog: C’mon, now…Play FAIR with our kids. The FAIR Education Act became law this Spring and is scheduled to be implemented in January. I am excited that as a result of this victory, when my kids Talia and Kobi learn California and American history, the roles of gay and lesbian men and women will be woven into the mix. Teaching history is complex. What students are taught has always been a reflection of our dominant culture and shapes how future generations understand the context in which they live. The FAIR Education Act offers the opportunity for our kids to receive a more fair and accurate picture of the people and events that have shaped our society, and LGBT people no longer be excluded from classroom discussions. The FAIR Education Act assures that the contributions of LGBT historical figures and events need to be fairly depicted in teaching the economic, political, and social development of California and the U.S. The law adds sexual orientation and gender identity, as well as disability to the list of protected classes - whose achievements can’t be made invisible when teaching our kids. This part of the education code was created to help correct an historic failure to accurately depict the role of non-privileged groups. So by adding sexual orientation, transgender people and people with disabilities, the FAIR Education Act is really a fix that brings the education code up to date and in alignment with other anti-discrimination laws in California. This law offers legal backing for the work Our Family Coalition is doing around the state to help bring LGBTQ inclusive material to elementary schools. This sounds simple, right? Kind of a no brainer. It sounds like it is protecting kids from harm, right? Helping conserve traditional values of respect and the Golden Rule, right? Really? A call to remove kids from public school? Allowing accurate depictions of history means that no factual materials will be allowed? That almost sounds like the Traditional Family Values Coalition does not support our representative democracy! And as a result they are now working to try to get a referendum on the ballot to overturn the FAIR Education Act. When this newsletter goes to print, the opposition has 10 days left to gather signatures to qualify for the June ballot. Regardless of whether or not the conservative right can get this on the ballot in June, the fact that they have repeatedly been able to spark fear in the hearts of many heterosexual parents about the mere utterances of the words gay and lesbian in the classroom is something that it is our work to change. 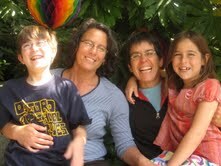 Every day I meet parents – both gay and straight – who are working hard to build the best life possible for their kids. Volunteering in schools, tutoring students who need extra help, helping their kids with their homework, and yes, helping to bring Welcoming Schools to their theirclassrooms. All with this shared goal of protecting kids and raising caring members of society. How can teaching hate possibly further this goal? How do they explain to their kids, when they are sitting around the dinner table, that in Gods eyes we are not all equal? How do they reconcile this with their teaching of the Golden Rule – do unto others as you would have others do unto you – as they are actively working to deny me and my partner the right to live in a long term committed relationship? I do believe that in order to truly win equality, it has to be OK with folks for our kids to learn about different family structures, for it not to be a big deal for them to learn that a historical figure was gay or lesbian, to be taught about Harvey Milk and the LGBTQ struggle for equality. We need every one of us to on the ground helping to educate the parents in our communities about the importance of keeping this law on the books. Help them see how teaching respect and inclusion helps their kids as well as yours. We need you there whether or not we are facing a referendum on the ballot in June, because after all, if teachers are afraid to say the word gay, how can we truly be equal? Visit ourfamily.org for more information about the status of the FAIR Education Act, or go to eqca.org.